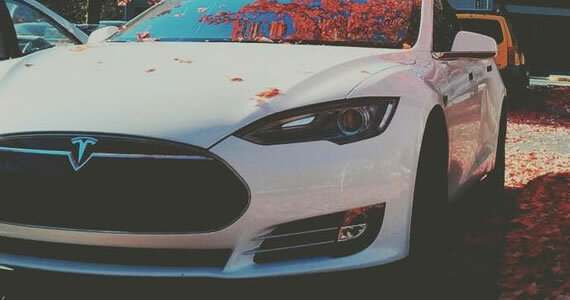 The Tesla Model S is a unique car that offers more than unusual technology. It is the only electric car that can really move. For those who want to drive a zero emissions vehicle but hate the usual compromise on horsepower, the Tesla Model S can go 0 to 60 in 4.2 seconds. The engine has a capability of 134 miles per hours, indicating that this car is well above the competitions 90 or 100 mpg limit. This car has 302 horsepower, outshining the Prius Plug-in, Chevy Volt and many regular engine cars and SUVs. This power makes the Tesla Model S very appealing to those who really like to drive. The streamlined body is considered a beautiful choice even among luxury models. The electric connector is hidden from sight. The tailpipes are missing since they are unneeded. The roof is an all glass panoramic that provides a convertible-like ride with the swipe of touchscreen. Fresh air lovers truly get the best of both worlds in the Tesla Model S.
When the driver approaches the Tesla, something unusual happens. The key signals the door handles to slide into place. With a simple touch, the driver or passengers can open the door. Otherwise, the door handles are tucked into the door, adding to the car’s aerodynamics. This feature also adds a measure of security against theft. When the driver opens the door, the touchscreen turns on, returning to the last image that was in use. When the driver secures the seat belt, the car turns on. These are some of the unique touches that give the Tesla Model S that futuristic feel. The makers have thought through the process if driving and made it an experience rather then a task. With its 17-inch touchscreen, Tesla outshines every other car on the market. For easy access, a line of commonly used controls appear at the bottom of the screen. From this one access point, drivers can control their stereo, high definition rear view camera, phone, and navigation. The car’s naturally quiet due to its electric power train and that is enhanced by Tesla’s meticulous noise abatement engineering. As a family sedan, the Tesla S seats five and offers eight airbags. It has a five star safety rating from the government’s safety testers. The rear cargo hold offers 34 cubic feet of space, more generous than any competitor. That same space hosts two jump seats, allowing parents the flexibility of extra seat belt-equipped seating for their children’s friends, teammates or carpool. The new model has been earning some much deserved attention. With the fine attention to detail in every aspect, the experts from Vaughan Metal Polishing Ltd say that even the metal on the trim have been primed to keep its shine and continually add to the design and feel of the car. They have covered all the seemingly little details to constantly showcase the look and design of the car. Although it’s expensive, the zero-emissions Tesla Model S offers better features and power than any hybrid or electric car to date. So whether this car has caught your eye for its lack of environmental footprint or just the stunning detail and feel, the car is a real beauty and because of the design and science behind it, it is a real contender as well.